Since 1996 Columbus, Ohio-based Quarkspace has released a virtual catalog of recordings that explores, and often combines spacerock, ambient, psych, and electronic experimentation. Guitars, keyboards, and effects produce a cosmic tapestry that never ceases to stir the listener's imagination. The band was formed in 1984 by college classmates Jay Swanson on keyboards, Kevin Wherry on Bass, and Darren Gough on guitar. Soon joined by guitarist/vocalist Chet Santia and drummer Paul Williams, the band played covers by such artists as Frank Zappa, Camel, Neil Young, and Talking Heads, with a few originals thrown in. 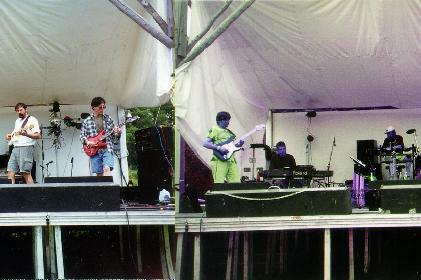 The inception of the current Quarkspace sound began when the band discovered "a knack for communal space jams". Several years passed with members coming and going due to school and other band projects. Stability ultimately set in with the current lineup being Darren Gough on guitars, Dave Wexler on guitars (guest on the self-titled CD release), Paul Williams on drums, percussion, and effects, Jay Swanson on keyboards and percussion, and Chet Santia on guitars, bass, and percussion. The first of their recorded works, Quarkspace's self-titled CD contains 12 songs and two instrumentals. It is their only work to date with vocals. The vocal numbers are notable in that the music is just as well structured and imaginative as on the instrumentals. Santia's vocals have a haunting quality to them that both complements and contrasts with the music. From the world music rhythms of "Dancing Swan", and the Peter Gabriel tinged "Oklahoma", to the full blown space jams of "Youthful Breeze" and "Teton Range", the CD is an excellent introduction to one of the more exciting bands on the current spacerock scene. "We have both songs and space. Some songs are composed or started by one or more members. Some songs come from the space, and then are more fully developed after the fact. We always space as a certain percentage of any practicing we do, and the Spacefolds series are taken from these jams. Some of the best of the best jams may make it on to a CD." Like any band that excels at improvisation, Quarkspace is not to be missed live. I caught them earlier this year as part of a spacerock series held at Cleveland's Symposium. During their two hour set the band distinguished themselves from other spacerockers in their diversity. One moment they would be doing songs, the next off on a cosmic jam, then a shift of gears for some space funk, and then an all out rockin' jam á la the Allman Brothers. All this came complete with a 60's-style lightshow provided by the Solar Fire Lightshow group. Solar Fire's arsenal included about eight overhead projectors and an old 16mm movie projector which displayed what looked like an educational space film on the band. It reminded me of one of those 60's Beat Club videos. Among the band's other major live appearances this year has been the Strange Daze SpaceRock Festival in Southwestern New York state, and the Orion Studios SpaceRock festival in Baltimore. No discussion of Quarkspace would be complete without mentioning National Steam, the offshoot band consisting of Dave, Paul, and Chet. The main difference from the Quarkspace lineup is that drummer Paul Williams plays keyboards and effects. National Steam's music is a close cousin to Quarkspace, though perhaps a bit more ambient in spots. Also part of the quarterly cassette series, Steamdream 2 has just been released. For more information and to hear sound files you can visit Quarkspace at their web site.